Come to Idaho to enjoy the beautiful drive along the Salmon River Scenic Byway beginning at Lost Trail Pass (elevation 6,995 feet) on the Montana border continuing south through Gibbonsville, North fork, Salmon, Elk Bend, Challis and ending in Stanley, Idaho. As you descend from the top of Lost Trail Pass on Hwy 93, witness the same majestic wilderness scenic views of the Salmon-Challis Forest that have changed little since the famous Lewis and Clark expedition traveled this way over two centuries ago. The Salmon River Scenic Byway offers many opportunities for camping, dining, shopping, and outdoor adventures along the way making this Salmon River Scenic Byway drive an ideal Idaho Vacation destination. This byway travels along side the Salmon River, this Salmon River and its forks are natural pathways into Idaho’s back country wilderness where deer, elk, moose and mountain goats can be seen grazing along the hillsides and meadows as you travel. The Salmon River is famous for world class fishing for Steelhead, Salmon and Trout along with thrilling Whitewater rafting on the Lower Salmon, Main Salmon or back country Middle Fork of the Salmon. Salmon River Scenic Byway Location – Drive from the Montana state line south on US Hwy 93 through the town of Salmon and continue on Hwy 93 So to Challis, then drive west on Idaho 75 to Stanley Idaho. Salmon River Scenic Byway Length – About 162 miles – Allow 3 1/2 hours driving time if you plan to drive straight through. Salmon River Scenic Byway Road Conditions – Two-lane, paved roads that are well maintained year round. Look for some 25 mile per hour curves. Best Times to enjoy the Salmon River Scenic Byway – The most comfortable weather for traveling the Salmon River Scenic Byway is April to November, however, if you plan to venture off to the back country then the roads are best from July to October. 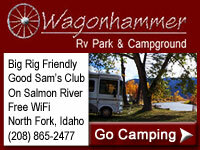 Wagonhammer RV Park & Campground – Beautiful spot with full hook-up sites along the Salmon River in North Fork Idaho, this pristine RV Resort is a Good Sam Park, Big Rig Friendly and Owner Operated. Allow Wagonhammer Camp hosts be your concierge to everything outdoors! 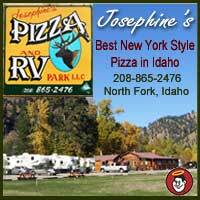 Josephines Pizza & RV Park – Extremely well maintained RV Park with 25 foot wide RV Sites along the North Fork of the Salmon River on Hwy 93 in North Fork Idaho. This Good Sam Park is Owner Operated, drive your ATV from campsite to beautiful ATV Trails. Fish for Cutthroat trout right from your site. Stop in to Josephine’s Pizza for a glass of wine, beer or margarita and enjoy delicious appetizers, pizza, burgers, and locally made desserts. Idaho Camping Spots to camp on your own – Salmon River, Riverside, Mormon Bend, Basin Creek, Upper and Lower O’Brien, Holman Creek, East Fork, Bayhorse, Spring Gulch, Cottonwood, Shoup Bridge, Tower Rock, Twin Creek.